Where do I use my Walls and Floors voucher code? Check out the latest deal for Walls & Floors at NetVoucherCodes and select the offer you wish to use. Click through to the Walls & Floors website. Browse products you want to buy and fill up your basket. Go to the checkout and view your basket. Enter your discount code into the box labelled ‘Do you have a Promotional Code/Gift Code?’. Select ‘Apply’ then ‘Proceed to Checkout’ to finalise your transaction. Add character to your walls and floors by choosing from a wide range of floor tiles from Walls and Floors. They provide elegant floor and wall treatments to truly give your home its much-needed style and character. There are hundreds of stylish possibilities when it comes to Wall Tiles. From modern brick-shaped Metro Tiles and captivating Moroccan designs, through to lavish natural stones like travertine and slate. A winning wall favourite is the staggered, multi-levelled slate split face tile; perfect for breathing new life into an old wall space. At Walls and Floors, you can find an expansive range of Wall Tiles, perfect for any room in any home. Browse their collection and choose your ideal tiles to make your home as sleek and stylish as possible. When it comes to tiling a floor space, there are several paths you can take. You could either create a captivating checkerboard effect or, alternatively, you could invite the natural look into your home. The Wood Effect Floor Tiles at Walls and Floors are perfect for floor areas and are alive with knots and realistic wood grain. There are also marble styled Floor Titles that give any home a luxurious feel and shiny, smooth floor tiles that look brilliant and are also extremely easy to clean! Mosaic tiles bring a stylish and contemporary approach to decorating a wall or floor. Whether you're tiling an entire bathroom or creating a captivating kitchen splashback, mosaics are very versatile and are incredibly easy to cut to size. They come in a variety of materials; from glass and resin, through to metal and natural stone. You can browse a range of colour palettes and styles when it comes to mosaic tiles, creating a neutral feeling in your home or a more bold, striking splash of colour, either way, both add character and style to any room in any house. See here for more delivery details. If you wish to return an item, you can do so within 60 days of your delivery as well as exchange your items in 365 days. If your items are damaged or incorrect, you will need to notify Walls and Floors within 2 days. However, if you're unhappy with your choice, you must return your items in their original packaging and in a resaleable condition. Find more Return info on the Returns & Exchange page. With over 20 years in the business, Wall and Floors have blossomed into one of the most loved retailers in its business! And now, in 2016, Walls and Floors offer an unbeatable range of tiles for all your home improvement needs. 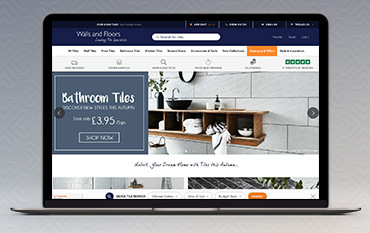 And with over 20 million tiles in stock, the Price Beat Promise, Fast home delivery, a great range of Walls and Floors discount codes and 5-star customer assistance, it's no wonder Walls and Floors has become Leading Tile Specialists. Boasting 29 years of excellent service, be sure to check out the fantastic range today!